Oak (Chap. III., Par. 29), plain or quartered. End rails. 4 pcs. 1 3/4"xl 3/4"xl6" S 4 S Legs. 3 pcs. 2 1/2"x3 1/4"xl7" S 4 S Base pieces and angle blocks. lpc. 1 1/4"x4 1/4"x32" S2S Stretcher. 2 pcs. 1/2"x1/2"x35" S4S Trim. 2 pcs. 1/2"x1/2"xl6" S4S Trim.. 1 pc. l/2" dowel 12" long. 1 dozen 1 1/4" brads. 2 dozen 6d finishing nails. 3 dozen 1 1/2" No. 10 F. H. B. screws. In recent years the piano bench has almost entirely taken the place of the piano stool; the bench is preferred for several reasons, not only because it is more pleasing from the artistic standpoint, but also because it is more serviceable. The bench affords room for two people and is thus convenient for duet work or for teacher and pupil. 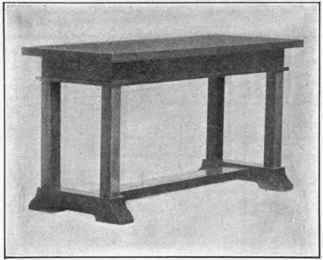 Benches are often so constructed as to furnish a receptacle for music; the one given in this lesson is not so designed, but if desirable you can easily make it in this way by adding a bottom and hinging the top. The kind of wood and style of finish for a piano bench should correspond as far as possible with the piano case. This is a piece of work which calls for great care and skill in every detail, for no one would want to use a piano bench which showed evidence of poor workmanship. The Expert Wood Finisher, Kelly. The National Builder, Chicago. Elements of Handicraft and Design. Benson. 9 - Voc. As the top is to be made of two pieces glued together, you should prepare it first, in order that the glue may have ample time to dry. These edges must be perfectly fitted and joined with dowels. Although the legs are furnished S 4 S, you must go over them with a keen plane, and make them smooth and perfectly square; they must then be finished with a sharp steel scraper. Cut them the desired length, being careful to make allowance for the tenons; cut a tenon 1" square on each end. 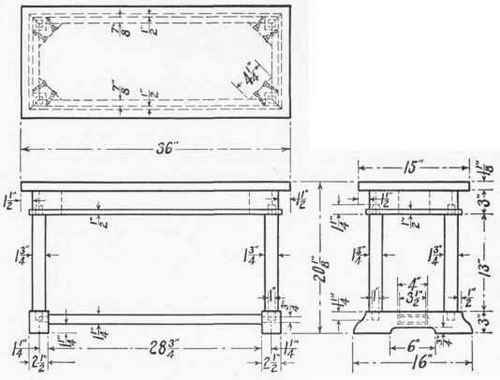 Square the stock, and carefully plane the rails to the dimensions shown in the drawing. These rails are to be joined at the corners with mitered joints. They should be cut in the miter box. Be sure the opposite side and opposite ends are exactly the same length. All joints must fit perfectly. On a piece of work of this sort ill-fitting joints would render it absolutely worthless.